The role of business in global governance is now widely recognized, but exploration of its role in global financial governance has been more haphazard than systematic. This book provides the first comprehensive analysis of the role of transnational financial associations (TFAs) in the organization of global finance. This book develops three theoretical themes of assemblage, functionality, and power as enrolment. These themes challenge approaches that treat financial power as emanating from a single location or force. Whilst existing approaches tend to treat TFAs as irrelevant or as merely transmitting power originating elsewhere, this book argues that power must be created by painstakingly assembling actors, networks, and objects that are often quite autonomous and working at cross purposes to one another—a process in which TFAs play a central role. The book explores these themes in chapters examining the roles of TFAs in interacting with public authorities, constructing global financial markets, and creating financial communities. The authors additionally analyse the roles of TFAs in the European Union, in the Global South, and in promoting goals other than profitability, including Islamic finance, microfinancing, savings banks and cooperatives. 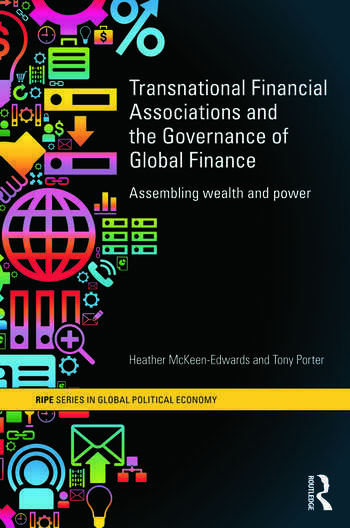 Making a distinctive contribution to our understanding of global finance and global governance, Transnational Financial Associations and the Governance of Global Finance is an important book for students and scholars of international political economy, finance, global governance and international relations. Heather McKeen-Edwards is Assistant Professor of Politics and International Studies at Bishop’s University in Sherbrooke, Canada. Tony Porter is Professor of Political Science at McMaster University in Hamilton, Canada.